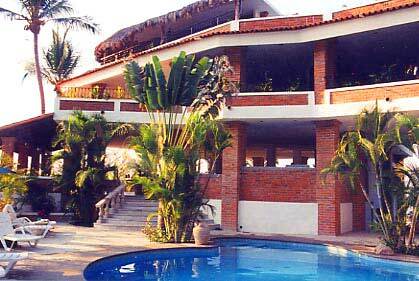 The Villa Las Palmeras provides Puerto Vallarta visitors with a very interesting lodging option. An upscale home, it has no less than 12 bedrooms, and as long as guests book at least five of the rooms, they can have the entire property to themselves. And what a property it is. Outside, the features include a swimming pool and a roof top deck and bar. Inside the home, such delights as Wi-Fi, cable TV, iPod hookups, and Sirius Satellite radio are among the welcoming amenities. Daily maid service helps to keep the Villa Las Palmeras tidy, and guests can also enjoy beverage service or even arrange to have a chef prepare some or all of their meals. There are 10 rooms and two suites to choose from in the Villa Las Palmeras. Each guest unit is air conditioned, and the suites have kitchen facilities. Guests who are interested can also interest themselves in the adjacent villa. It offers nine bedrooms and plenty of extra space. Either way, it is an easy walk to shops, bars, restaurants, and beaches. Taxis are usually easy to come by outside of the villa for trips to destinations that are further off.